What are the top Sabah attractions? What to see? Sabah is the easternmost and second largest state in Malaysia, located on the legendary island of Borneo. It has much to offer the visitor, ranging from the lofty Gunung Kinabalu (the highest mountain in the country), pristine national parks, exotic wildlife including orangutans and proboscis monkeys, the best scuba diving in Malaysia and some of the nation's top beaches. Added to that are some historic sites and museums, heritage trails, caves, river cruises, the colourful customs of the indigenous peoples and much more. Malaysia's three highest mountains are all found in Sabah. Mount Kinabalu would probably be at the top of most people's top Sabah attractions because it is easily the tallest peak in Malaysia (4,101m) and one of Asia's most popular climbing destinations. Most climbers take two days, breaking the journey overnight at Laban Rata. It is hard work but a worthwhile experience. The second highest is Gunung Trus Madi at 2642m. 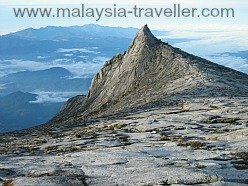 Experts rate it as a fairly easy climb and from the top, weather conditions permitting, climbers can enjoy a fine view of Gunung Kinabalu. The third highest peak is Gunung Tambuyukon (2,579m). Although it is a lower altitude, it is the hardest of the three climbs and the view from the top is not that spectacular and for those reasons it is less frequently climbed. Kinabalu National Park, 88 km (2-3 hours drive) from Kota Kinabalu, covers an area of 754 sq. km. If you do not feel up to climbing Mt. Kinabalu there are plenty of other nature trails in the park which contains thousands of species of plants, orchids, butterflies and birds. The park is very well managed and is a UNESCO World heritage site. Not far from Kinabalu National Park is the small tourist resort of Poring, famous for its Poring Hot Springs. These springs are hot pools of mineral water which are said to have healing and therapeutic properties, ideal for bathing the weary muscles after a climb of Mount Kinabalu. Danum Valley Conservation Area is an unspoilt nature reserve which received world attention from the recent visit of Prince William and Kate. Things to do include a canopy walk, nature trails, river trips and bird watching. A similar environment can be experienced at Maliau Basin Conservation Area, an even more remote wilderness covering 590 sq. km. of virgin forest in southern central Sabah, where nature photography, night safaris, waterfall swimming and jungle trekking are among the activities. To reach there involves a 5 hour bumpy jeep drive from Tawau or a more expensive helicopter trip. A more readily accessible park is the Crocker Range National Park, gazetted as a protected area in 1984 to conserve the area's bio-diversity and preserve the source of much of Sabah's fresh water. This huge park is home to various species of primate, sun bears, porcupines, wild boars and leopards and a vast variety of birds. Tawau Hills National Park, 24 km from Tawau, is another park created to protect water catchment resources, this time for Tawau Town and the Semporna Peninsula. Activities include a lowland garden walk, jungle trekking, camping, visiting the Table Waterfall with a natural swimming pool, and the Mountain Trail Challenge which covers two mountains, Gunung Magdalena (1310 metres) and Gunung Lucia (1201 metres). Tabin Wildlife Reserve is the largest wildlife reserve in Malaysia with an area of 123,000 ha in which can be found endangered species such as the Asian elephant, Sumatran rhinoceros and the Tempadau (a wild cow). Everybody loves orangutans and one of the best places to see them is the Sepilok Orang Utan Sanctuary, close to Sandakan. Here you can learn how you can help orangutans and watch them from the viewing platforms at feeding time. 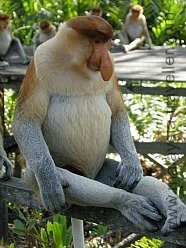 Also near Sandakan is the Labuk Bay Proboscis Monkey Sanctuary. Due to rampant deforestation and destruction of their natural habitat these curious looking monkeys are now highly endangered with only a few thousand left in the wild. One way of seeing rare orangutans or proboscis monkeys in the wild is to take a two or three day Kinabatangan River Cruise. This is a great way to experience the Borneo rainforest and spot unique wildlife that you cannot see from a motor vehicle. The giant, rotten meat-smelling Rafflesia flower is one of the must-see top Sabah attractions for both local and foreign visitors. The Rafflesia Information Centre at the Tambunan Rafflesia Forest Reserve is the place to arrange a guide to lead you one of these flowers in bloom. Sipadan Island is rated as one of the top ten best dive destinations in the world. Its coral formations attract green and hawksbill turtles, barracuda, big-eye trevally, manta rays, hammerhead sharks, whale sharks and countless colourful smaller fish. There is also good diving at the nearby Mabul and Kapalai Islands. Tun Sakaran Marine Park (also known as the Semporna Islands Park) is the largest marine park in Sabah and comprises eight islands, some of which are formed from the remains of extinct volcanoes. Tourism facilities are not yet developed but visitors may scuba dive or snorkel in the park's dive sites. Mataking Island is another favourite dive resort island in the Celebes Sea. The Turtle Islands Park, 40km north of Sandakan, comprises three small islands, Selingan, Gulisan and Bakungan Kecil. Limited numbers of visitors can overnight on Selingan to observe green or hawksbill turtles come ashore to lay their eggs. Lankayan Island is another nesting site for turtles and also one of the east coast's popular dive sites. Over on the western coast of Sabah, the Mantanani Islands are an idyllic spot for diving, snorkelling and beach activities. Layang Layang is an atoll reef far out in the South China Sea, around 300km from the Malaysian coastline. It has its own airstrip and a dive resort, rated again as one of the top ten dive locations in the world. Berhala Island in Sandakan Bay has served as a leper colony and a prison camp but today is popular with day trippers for the beach and rock climbing on its sheer pink cliffs. Kelambu Beach in Kudat is one of the best beaches in Sabah with clear blue water and fine white sand. Things to do here include water skiing, swimming, and snorkelling. The Tunku Abdul Rahman Marine Park comprises five beautiful islands close to Kota Kinabalu. The five islands, Pulau Gaya, Pulau Sapi, Pulau Manukan, Pulau Mamutik and Pulau Sulug, have white sandy beaches, water sports, jungle walks and some are inhabited by giant lizards. Tanjung Aru Beach is located on the outskirts of Kota Kinabalu. It is fringed with casuarina trees and food stalls and is a popular place for locals to watch the sunset. Mengalum Island is the location for the annual Sabah International Game Fishing Tournament. Gomantong Caves are famous for the bravery of the edible bird's nest harvesters who climb high into the upper recesses of the cave to collect this valuable delicacy made by swiftlet birds. Tourists can use the boardwalks to explore the two main caves. 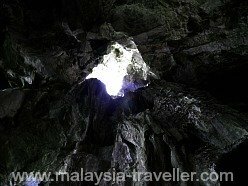 Birds' nest soup fans might also be interested in Madai Caves not far from Lahud Datu. Madai is the most visited of a complex of 25 bat-infested caves and is actively harvested for birds' nests by the local villagers. 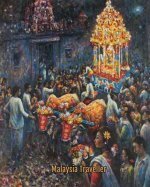 The nearby Baturong Caves is a burial cave and a number of ancient coffins have been found there. Baturong is not as easily accessible as Madai and it might be necessary to hire a guide. Batu Puteh Caves contain more than a hundred wooden coffins thought to be over 200 years old and of Chinese origin. North Borneo Steam Railway. Not quite the Orient Express but a pleasant little novelty train trip to conjure up the feel of yesteryear. Complete with tiffin lunch. 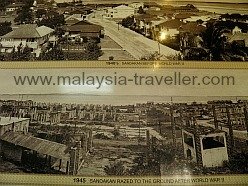 Sandakan Heritage Trail. This trail covers all the historical attractions this town has to offer. Sandakan Memorial Park. This park is built on the site of a former WWII POW camp and was the starting point of the infamous Death March. Signal Hill, Kota Kinabalu is a viewpoint overlooking modern Kota Kinabalu. Nearby is the Atkinson Clock Tower, the oldest building in KK and one of only three structures to survive the bombing raids during the war. Sabah Foundation Building is one of KK's modern landmarks, a steel and glass cylindrical tower block. Sabah State Museum & Heritage Village. Sabah's leading museum. Mat Salleh Memorial. Marking the story of Mat Salleh who led a rebellion against British rule of Sabah. Kundasang War Memorial. A memorial garden commemorating the British and Australian victims of the notorious Death March and all those Malaysians who died helping them. Read more on my blog. State Mosque. Ornate, golden-domed mosque in the state capital, Kota Kinabalu. Floating Mosque, Kota Kinabalu. Officially known as the City Mosque, this white mosque appears to float above a man-made lagoon. Rumah Terbalik di Sabah. This unusual attraction is an upside down house, complete with furniture stuck to the ceiling. Long Pa Sia. This remote village is located close to the border with Sarawak and Kalimantan. Visitors can experience village activities such as fishing, farming, hunting and making handicrafts. A hike to nearby Mt. Muruk Miau (2084m) is also possible for fit adventurers. Mari Mari Cultural Village. This village showcases the traditional homes, customs and culture of some of Sabah's ethnic communities including the Bajau, Lundayeh, Murut, Rungus and Dusun. Monsopiad Cultural Village. Monsopiad was a legendary Kadazan warrior and head-hunter and this village helps his descendants to keep alive their culture and traditions. Kota Belud (Sunday Market). Browse the local produce and food on sale at this weekly market. Tamu Tamparuli (Wednesday Market). Another colourful market. Mengkabong Water Village. This is a kampung air, a village built on stilts above the water inhabited by the Bajau community. If you have suggestions for more places that should be included on the list of Top Sabah Attractions please let me know. 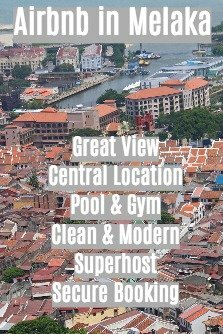 Need somewhere to stay in Sabah? Take a look at Agoda's website for a huge selection of Sabah hotels to suit all budgets at discounted rates.